The expert breeders at Elite Seeds in Spain created something truly special with their Blue Elite Indica. This strain with an ancestry of some of the best Kushes shines with several qualities including an excellent taste, impressive production and a powerful and long-lasting Indica high. There are good reasons why Kushes are among the most-liked strains among cannabis enthusiasts. Probably the most important one is the unmistaken Kush taste that many connoisseurs deem as one of the best tastes when it comes to first-class weed. The guys at Elite Seeds obviously agree with this. 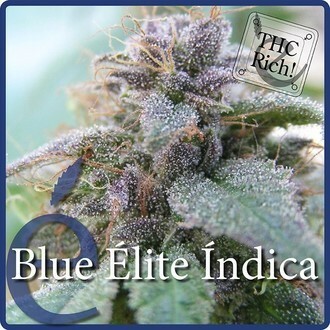 They took some of the best Kushes from their stock of select premium plants to make their Blue Elite Indica that sure will satisfy anyone and in particular Kush lovers. Blue Elite Indica can easily be grown indoors or outdoors and doesn’t have any special requirements when she grows. The plant will get to a medium-height where she’ll develop a number of large side-branches giving her a bushy appearance. What makes Blue Elite Indica stand out is that she’ll develop beautiful purple and blue buds that will be sticky with tonnes of very aromatic resin. Seeing that the plant is an excellent producer she is a good choice if you want to make BHO oil or some first-grade hash. Blue Elite Indica doesn’t just impress with a nice appearance. Her scent and aroma are right up there in the same league. She combines Kushy and earthy flavour notes with mouth-watering sour strawberry notes wonderfully, making for an extraordinary smoking experience. This 90% Indica has measured as high as 19% of THC which makes for a very potent, extremely relaxing high that is physical and cerebral at the same time. You can’t really find a flaw with Blue Elite Indica from Elite Seeds. This is a most-excellent Kush that will delight Kush lovers and anyone else once they get a taste of her!